Taylor Made Container Homes build and deliver container homes and offices throughout New Zealand. We’ve built a wide range of shipping containers into a huge variety of options from storage facilities to self-contained studio units to pop up kitchens and more. We help our clients with the design, drawing up space-saving container home plans, through to the build, local consent process and successful delivery of your container home or building. Throughout our years of building pre-fabricated container buildings, we’ve had the opportunity to work with some fantastic clients and some of them have been nice enough to give us a testimonial. 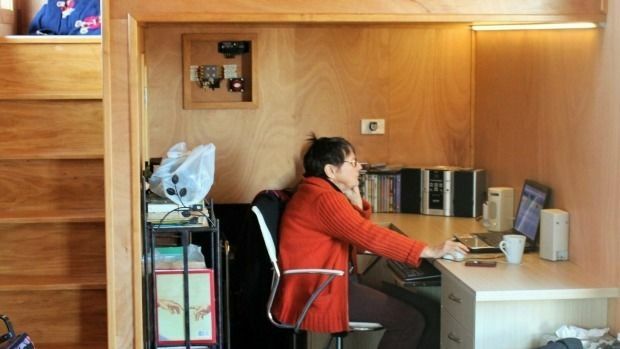 Giselle Dexter, 70, is happy in her compact hillside home. Giselle Dexter has fully embraced permanent living in her lofty container home at Queensbury near Wanaka. She now resides next door to her son and his wife, in a 12m container that is now her cosy home. "I thought about earth homes and that sort of thing but I'm too old for that now. I didn't want to have a mortgage at any cost and I wanted something easy to look after. I'm on leasehold land here and this can be picked up and moved. My son thinks I'm absolutely nuts but that's okay," she laughs. The 30sqm home has an office, mezzanine floor bedroom, mini logburner and separate bathroom. Dexter says there's room aplenty for her and her hard-of-hearing companion, Sophie the dog. It's a far cry from her previous job, managing a high-rise apartment building in Auckland, but Dexter says she's loving the rural life, waking every day to different skyscapes over the Upper Clutha valley. "There is no need for curtains up here."